No, it’s not peace in the Middle East. But it’s something. 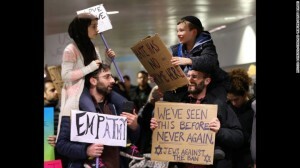 A photo of two kids — a Muslim girl and Jewish boy — rallying for the same cause alongside their dads, warmed the hearts of audiences across social media. For what it’s worth, I spotted a significant number of Jewish people at last night’s Montreal vigil to support the Muslim community in the wake of the Quebec City attack, too. Just a few years ago, this sort of unity between our two communities would have been almost unheard-of. I think the turning point — as far as I can remember — came when we marched side by side to protest against the Charte des valeurs. Thus proving that when the issues are important enough, we can unite and find common ground. That doesn’t mean there aren’t still big issues to tackle. But I think we’re all looking for nuggets of hope this week. This is one. Rightward shift for American Jews?